Dan's Baby Back Ribs – you can make tasty ribs. 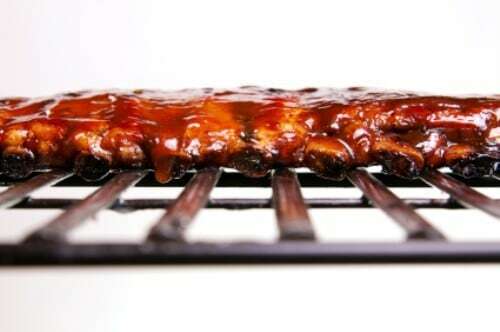 Home » Meat Recipes » Dan’s Baby Back Ribs – you can make tasty ribs. Dan’s Baby Back Ribs – you can make tasty ribs. Tasty ribs are easy to make. The bulk of the time these ribs spend time in the crock pot and then are finished up on the grill. Thanks to JerseyGirl for sharing this recipe. You can make tasty Baby Back Ribs just like Dan does, barbeque sauce and honey are slow-cooked together for one amazing plate of ribs. Place frozen ribs into a 5-7 quart Crock Pot with onion. Turn on High and cook for 6 hours. Mix the Barbecue Sauce and Honey together in a bowl for basting. Set aside. When ribs are done place them immediately on the grill (325 degrees - Medium heat). Baste the ribs with the sauce honey mixture for 10 -15 minutes. They will fall off the bones. These were a hit with my peeps.